Anne Hathaway cut her hair for a movie. She’s so daring. She has so much courage. This entry was posted in What If They Grew A Steesh... and tagged Anne Hathaway, Celebrity, mustache, Short Hair on April 10, 2012 by Los Bulls. I could copy and paste things from the interweb about Jared, but is it worth it? He’s an actor and musician. 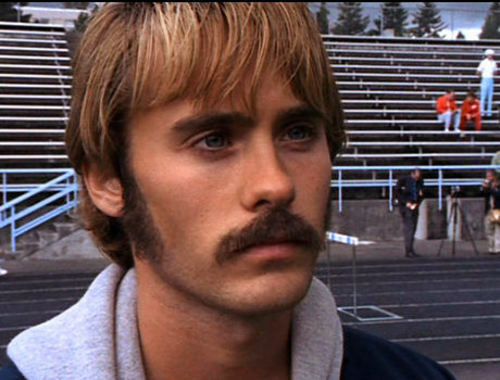 He played Prefontaine. He’s been in other stuff. I saw him throw out the first pitch at a Cubs game once. That’s about it. This entry was posted in Movie Steesh, Musician Steesh, TV Steesh and tagged 30 Seconds to Mars, Jared Leto, mustache, Prefontaine on April 10, 2012 by Los Bulls.